Click here to RSVP for the Teach-In. Full event descriptions and location information below. You can also download a PDF of the event booklet here. Please note: We have updated some of the locations below – please be sure to check in at the Registration Desk each day before heading to your events. Thursday & Friday: Registration Desk can be found in Design Center, Stueben Hall. Saturday: Registration Desk can be found in Higgins Hall. Pratt’s Main Campus is located at 200 Willoughby Avenue with a second entrance at the corner of Dekalb and Hall. Higgins Hall is located just off of Main Campus at 61 St. James Place, Brooklyn NY. Click here for a detailed map of Pratt’s Campus with event locations indicated with red circles. Photographs will be taken throughout the events and posted to social media. If you would NOT like your photograph taken, please let the moderator know during your event. Hosted by Mahogany L. Browne & BLM Pratt and featuring the art installation “Niggas Die Everyday” by Falu & Kevin Sanchez.“Niggas Die Every Day…An Exhibit” reconciles the legacy of racial injustice in the United States with the angst and aggression of the hip-hop generation. Comprised of painting, sculptures, mixed-media and performance art. “Every Day” aims to move the conversation of systematic racial oppression past the comfort of hindsight and into a more contemporary and exigent purview. Lead by Maureen Benson and featuring guest artist, Paul Tran, this is a workshop to engage in a balance of honest self-reflection and planning for effective action. RSVP using the link at the top of this page & share on social media by clicking here. THIS SESSION IS FULL. If you’d like to be added to the waitlist please email blmpratt@gmail.com. Lead by organizer, Amin Husain and featuring spoken work artist, Jive Poetic, this workshop will explore the movement #DeColonizeThisPlace. DecolonizeThisPlace is a movement space that is action-oriented around indigenous struggle, black liberation, Free Palestine, global wage workers and de-gentrification. RSVP using the link at the top of this page & share on social media by clicking here. Lead by Jive Poetic, this workshop will not only discuss Rap and Hip Hop as a form of literature, but also create discourse about how this and other contemporary forms of poetry serves as tools to activate and educate young minds. THIS SESSION IS FULL. If you’d like to be added to the waitlist please email blmpratt@gmail.com. *Main Building is accessible by ramp and elevator from the far side of the building at the 200 Willoughby Ave entrance near the dining hall. Please contact blmpratt@gmail.com if you are attending this workshop and would like assistance finding the workshop when entering the far side of the building. Led by Tongo Eisen Martin, the Unity and Struggle workshop will cover realities of late stage imperialism and organizing against it. We will especially focus on consciousness; how do people accept the illusion of a permanent empire or oppressor, what does that counterrevolutionary acceptance look like, and conversely, what is revolutionary consciousness (at least in practice). We will begin to answer for ourselves how do we relate to each other now, and how do we need to relate to each other to win liberation. RSVP using the link at the top of this page & share on social media by clicking here. *Please note: The Engineering Building has elevator access, but there is no ramp access to the building; four steps lead to the front doors. Sponsored by Humanities and Media Studies, free refreshments will be available for Teach-In attendees. Hosted by the Women Writers of Color student group, the Insurgent Poets Society, and BlackLivesMatter Pratt. Share your language and art to express outrage and to build solidarity and resistance. Everyone welcome. RSVP using the link at the top of this page & share on social media by clicking here. The Dialogue Arts Project (DAP) partners with communities to create energizing training experiences in order to help participants collaborate & communicate more effectively across lines of social identity. DAP’s leading-edge workshops use the arts as a shared entry point into critical discourses around identity to increase awareness of self & social diversity. Coffee & tea will be provided by Pratt Student Affairs. RSVP using the link at the top of this page & share on social media by clicking here. Lead by Salome Asega and Ayo Okunseinde and featuring artist, Anthony MchPherson, Alternating Futures will talk about models for participatory tech and design projects with particular emphasis on Iyapo Repository. The Repository is a resource library which houses a collection of digital and physical artifacts created to affirm and project the future of people of African descent. The collection is managed and developed through a series of participatory workshops where participants become archivists of a future history they envision. We’ll end the talk by running through a condensed version of an Iyapo Repository workshop. RSVP using the link at the top of this page & share on social media by clicking here. Led by Tongo Eisen Martin, the Unity and Struggle workshop will cover realities of late stage imperialism and organizing against it. We will especially focus on consciousness; how do people accept the illusion of a permanent empire or oppressor, what does that counterrevolutionary acceptance look like, and conversely, what is revolutionary consciousness (at least in practice). We will begin to answer for ourselves how do we relate to each other now, and how do we need to relate to each other to win liberation. THIS SESSION IS FULL. If you’d like to be added to the waitlist please email blmpratt@gmail.com. Arming Yourself with Black Joy featuring Black Nerd Problems is a panel discussing an era of politics and governing that is not only an about-face from the previous administration, but openly hostile towards people of color. Black Nerd Problems is not only a pop culture website, but a community built around fighting for representation in the media we consume and practicing resistance by finding the Blackest joy in all things entertainment and nerdy. Writers for the site will be speaking on how they find the quiet in all the noise shouted against them and where you can find the simple pleasures you need to recharge you for the battle we’re facing. RSVP using the link at the top of this page & share on social media by clicking here. Clint Smith, the author, poet & PHd Candidate, will talk about the relationship between poetry and history, and how art can be used as a means of reorienting our understanding of the past. RSVP using the link at the top of this page & share on social media by clicking here. The Empowerment Summit series was designed in 2016 as a way to promote racial well-being on Pratt’s campus. This year’s rendition of the Empowerment Summit continues that mission with a focus on artistic practice & self-care. Led by students in the MFA in Writing & Activism program, facilitators Adriana Green and Sasha Banks will guide participants through a deeper look at their own artistic practice while exploring contemporary artists’ navigations of oppression & self-care within the Black community. THIS SESSION IS FULL. If you’d like to be added to the waitlist please email blmpratt@gmail.com. The Programs for Sustainable Planning and Development (PSPD) graduate student-led workshop will explore Pratt’s relationship with the long-term community around the campus and will feature artist, Paul Tran. Through a participatory and interactive workshop, we will discuss the physical barriers in urban environments that create both physical and mental barriers for communities which perpetuate racial/social injustices. RSVP using the link at the top of this page & share on social media by clicking here. The African American Policy Forum (AAPF) presents: #SayHerName: An Evening of Art & Action co-curated with AAPF Artist-in-Residence, Abby Dobson & Nina Angela Mercer. The night will feature a variety of art forms with specific emphasis on spoken word poetry and music. Through performance, the artists will seek to lift up the names and stories of Black women who have been victimized by state violence and killed by the police. Together we will say their names and honor their lives. RSVP using the link at the top of this page & share on social media by clicking here. “Writer/director Shola Lynch follows up her 2004 documentary Chisholm ’72: Unbought and Unbossed with this film centered on the struggle of educator and activist Angela Davis, an outspoken UCLA professor whose affiliation with the Communist Party and the Black Panthers landed her on the FBI’s Ten Most Wanted list while challenging our perceptions of political freedom in America. From her early years as a student in the U.S. and abroad to her highly publicized arrest and trial following the brazen hostage-taking and murder of Marin County judge Harold Haley in California, Lynch‘s film leaves no stone unturned as it explores every remarkable detail of Davis‘ life, and allows her to tell her own stories through a series of intimate interviews.” ~ Jason Buchanan, Rovi. Discussion directly following film screening includes; Shola Lynch, Film Director of Free Angela and All Political Prisoners,Christina Greer, Associate Professor of Political Science at Fordham University and Malcolm Shanks. RSVP using the link at the top of the page & share on social media by clicking here. 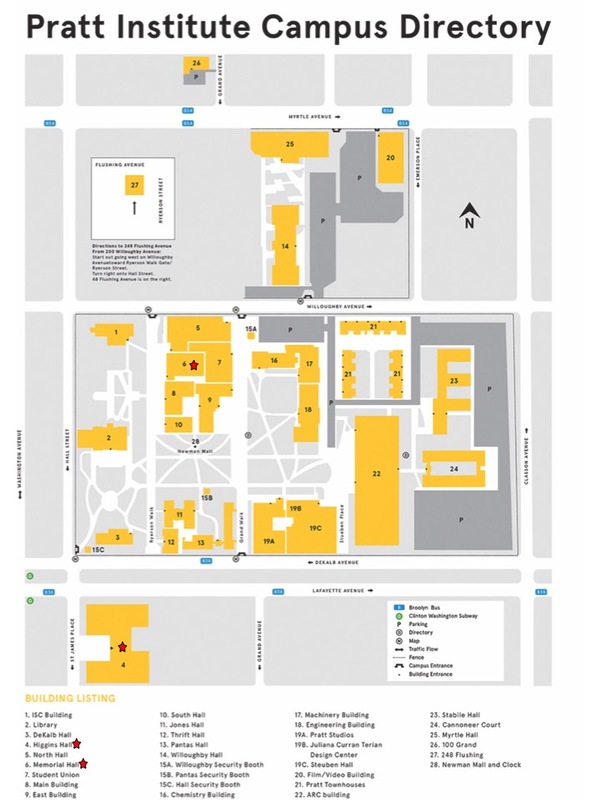 *Memorial Hall is accessible by ramp and elevator from the far side of the building at the 200 Willoughby Ave entrance near the dining hall. Please contact blmpratt@gmail.com if you are attending this event and would like assistance reaching the event space when entering the far side of the building. Time to enjoy refreshments and check-in before starting the final day of the Teach-In. Performing Stories of Creative Activism begins with the prompt: “What are the different ways you can use movement to illustrate creative responses to injustice?” From this prompt, participants will create their own authentic movement vocabulary to illustrate a scene of injustice they’ve witnessed as well as creating their response or desired response to that specific inequity. THIS SESSION IS FULL. If you’d like to be added to the waitlist please email blmpratt@gmail.com. Panel participants will examine how urban planning efforts in New York City have impacted racial justice struggles, and will explore whether planning decisions and outcomes have been of value to the Black Lives Matter movement. The panelists will discuss their views on how the Black Lives Matter movement can use the tools of urban planning to meet their goals. This panel is geared towards community planners, sustainability planners and preservationists, some of whom may not be familiar with racial justice issues, as well as organizers and activists who may not be familiar with the role of urban planning in policy and equity work. Co-hosted by the Pratt Center for Community Development and Pratt’s Programs for Sustainable Planning and Development, the panel will be moderated by Giovannia (G) Tiarachristie, a recent PSPD alumna. Speakers will include Mark Winston Griffith, Executive Director of The Brooklyn Movement Center as well as other planners, activists, and organizers currently working in the field of urban planning. Spoken word artist, Steven Willis perform at this event. THIS SESSION IS FULL. If you’d like to be added to the waitlist please email blmpratt@gmail.com. Cultivating a Grassroots Organization is a panel discussion sharing experiences, obstacles and successes for any burgeoning organizer. Featuring poet, Anthony McPherson and focusing on citizenship of campus and wider communities. Panelists include: Camonghne Felix (poet/essayist/speechwriter/organizer), Tongo Eisen Martin (The Last 3%), Jive Poetic (Insurgent Poets Society). RSVP using the link at the top of the page & share on social media by clicking here. BREAKOUT: Black & Brown Stand Up: Unidos, Si Se Puede! Led by Jazmin Peralta, Pratt’s Asst. Director of Special Projects for Equity and Inclusion. This breakout session explores: Instead of wondering ,“What about Latinx lives?”, this session affirms the need as to why Latinxs should support and stand in solidarity with the #BlackLivesMatter movement. It explores the many lived experiences of Latinxs in America who also experience racialized police brutality and mass incarceration at disproportionate rates, along with anti-immigrant laws that aim to break families apart. It also explores the causes as to why the Latinx community may not feel connected to the movement. THIS SESSION IS FULL. If you’d like to be added to the waitlist please email blmpratt@gmail.com. All attendees are invited to come to this brief gathering to check-in as participants and talk about and begin to wrap-up this year’s teach-in. The closing circle will be led by the co-chairs of BLM Pratt, Nakisha Henry and Daniel Wright. Featuring speakers Camonghne Felix and Amin Husain, as well as a screening of a video featuring Claudia Rankine, as well as performances by Virginia Poet Laureate, Time Seibles, Tongo Eisen Martin, Brotherhood Dance, Usama Siddique, and Sharon Ling. RSVP using the link at the top of the page & share on social media by clicking here. *Note: This event is not held in Higgins Hall. Click here for map view.